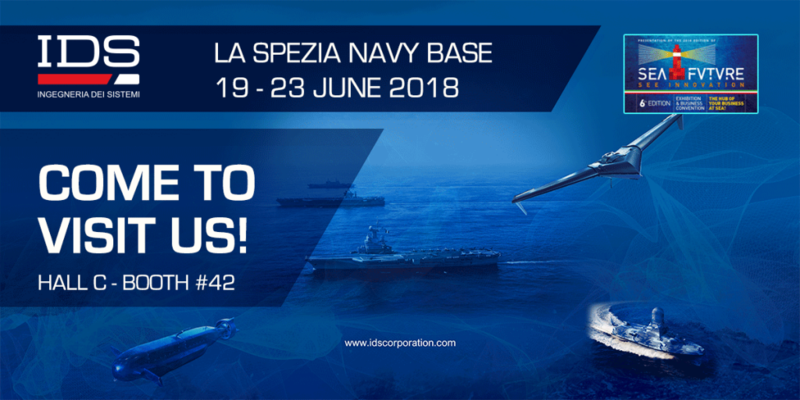 IDS will be at the 6th Seafuture, the foremost event in the maritime technologies sector in La Spezia (Italy) from the 19th to the 23th of June. At Seafuture 2018 IDS will display its full range of Naval products such as ElectroMagnetic Engineering, Satellite Terminal, and air/surface and underwater unmanned systems. At the entrance to the IDS stand, you will find the IDS IA-17, a small fixed wing UAV designed to maximise the performance for patrol, surveillance, and reconnaissance missions. We will also be showcasing the SAND Project including providing an update on the status of this Naval Surface Drone dedicated to Search and Rescue – SAR and Environmental control. SAND is a collaboration between EFFEBI shipyards, MECCANO Engineering ship Design Company and IDS. For more information on IDS’s services and products, come and visit us at Hall C, stand 42.